At this point, Donald Trump has had quite a few weeks that could plausibly be described as the worst week of his presidency. However, last week is very possibly at the top of the list. It started with the disastrous Putin summit, and continued with days' worth of fallout from that. Then there was the arrest of Mariia Butina, more tariff drama, the revelation that Michael Cohen had recorded the Donald, and the steady drip, drip, drip of news from the Mueller investigation. And so, Trump began blowing his top on Sunday night, with the ALL CAPS Iranian blast, and continued throughout the day on Monday. .....“Carter Page wasn’t a spy, wasn’t an agent of the Russians - he would have cooperated with the FBI. It was a fraud and a hoax designed to target Trump.” Tom Fitton @JudicialWatch A disgrace to America. They should drop the discredited Mueller Witch Hunt now! On reading these, one is reminded of Luke Skywalker's line from "The Last Jedi": "Amazing. Every word of what you just said was wrong." It is true that Trump is largely parroting Fitton, but it is nonetheless the case that everything here is incorrect (well, Fitton's name is spelled correctly). It's also the case that Trump is apparently back to believing that Russian involvement in the election is a hoax, and that there is no truth to the opinions of the intelligence pros, and no substance to the indictments (and guilty pleas) already produced by the Mueller investigation. Making baseless accusations of an improper relationship with Russia is inappropriate...When you have the highest level of security clearance, when you're the person that holds the nation's deepest, most sacred secrets at your hands and you go out and you make false accusations against the President of the United States, he says that's something to be concerned with. Again, note that the administration has returned to asserting that all of this is false, baseless, etc. Trump's threat reveals an astonishing blend of—to be very blunt—petulance and ignorance. It is petulant because it is motivated entirely by Trump's pique, and by what makes him feel best about himself. Former members of the intelligence establishment, when they retain their clearance, do not do so as a "perk" or so that they can monetize it. They do so in order to be available as a (pro bono) sounding board for their successors. Sometimes it is nice to talk things through with someone who's been through the wringer. It is true that Trump never sees the need to pick up the phone and chat with Barack Obama, the Bushes, or any of his other predecessors. But because he's cranky, he would deny the same opportunity to the folks who are currently tasked with keeping American safe. Meanwhile, it's ignorant because—beyond showing no understanding of why people keep their clearances—some of the folks that Trump threatened do not actually have a clearance any more. That includes Comey, who has assiduously resisted efforts to restore his clearance because he suspects (probably correctly) that the President would accuse him of leaking information. With Sen. John McCain (R-AZ) sidelined in Arizona battling brain cancer, the Republican majority in the Senate is effectively 50 to 49. That means if the Democrats stick together, a single Republican defection could sink the confirmation of Judge Brett Kavanaugh to the Supreme Court. Sen. Rand Paul (R-KY), who loves being in the spotlight (what senator doesn't? ), has said he is genuinely undecided on how he will vote. Paul said: "Kavanaugh's position is basically that national security trumps privacy. And he said it very strongly and explicitly. And that worries me." Nevertheless, for a senator to buck his own president on such an important issue as a Supreme Court confirmation requires a backbone of steel. On the other hand, Paul is a long-time opponent of government snooping on everyone. Judge T.S. Ellis, who is known for his speedy trials, has delayed the trial of former Trump campaign manager Paul Manafort until July 31 to give his attorneys more time to go over 120,000 pages of government documents they have received. Many of the documents came from the electronic devices of Manafort's former business partner Rick Gates, who has pleaded guilty and is cooperating with special counsel Robert Mueller. On the other hand, the judge also officially granted five witnesses immunity, which means they cannot plead the Fifth Amendment to avoid answering questions. This development is bad news for Manafort. On Monday, we learned a little bit more about the recordings that former Donald Trump lawyer/fixer Michael Cohen made, namely that federal prosecutors now have 12 of them. The court-appointed referee, Barbara Jones, had been thinking about whether or not they should be privileged. However, with Team Trump waiving privilege, she promptly handed them over. Unfortunately for inquiring minds, the court filing detailing this development offers little other information. So, the content of the recordings, their length, the parties who are speaking, etc., remain a mystery. The America Rising PAC, which did oppo research on Hillary Clinton in 2016, is trying to raise $8 million to conduct oppo research on as many potential Democratic presidential candidates as possible, well in advance of the primaries. Presumably the focus will be on taking down the Democrat who looks most likely to be able to beat Donald Trump in 2020. The group, which operates out of the fifth floor of an office building in Rosslyn, VA, already has 75 employees hunting for dirt. It has filed over 300 Freedom of Information requests and monitored 700 campaign events. Any information that might hurt a candidate is welcome, especially tidbits that could alienate some Democrats. For example, Gov. Andrew Cuomo (D-NY) and Sen. Elizabeth Warren (D-MA) have fought for equal pay for women, but pay women less than men in their own offices. After the embarrassing failure of his previous nominee to lead the Veterans Administration, namely Adm. Ronny Jackson, Donald Trump picked just about the safest candidate possible: Robert Wilkie. Wilkie is the son of an army careerist, was himself a reservist, has worked for several senators, served as an assistant defense secretary under George W. Bush, and was the acting head of the VA. On Monday, he was confirmed to lead the federal government's second-biggest bureaucracy by a vote of 86 to 9. Most political news outlets, us included, are following the Senate and House races closely. Surprisingly, however, the 36 gubernatorial contests this year are barely on anyone's radar, despite their enormous importance. For starters, all governors except those in New Hampshire and Vermont serve 4-year terms. That means when redistricting is done after the 2020 census, 34 of the governors elected this year will still be in office and can sign or veto (gerrymandered) congressional maps. This will affect the makeup of the House for 10 years. Second, as the federal government loosens regulations relating to the environment, labor laws, and more, states can toughen their own laws, with governors playing an important role. So let's take a look at the gubernatorial races. 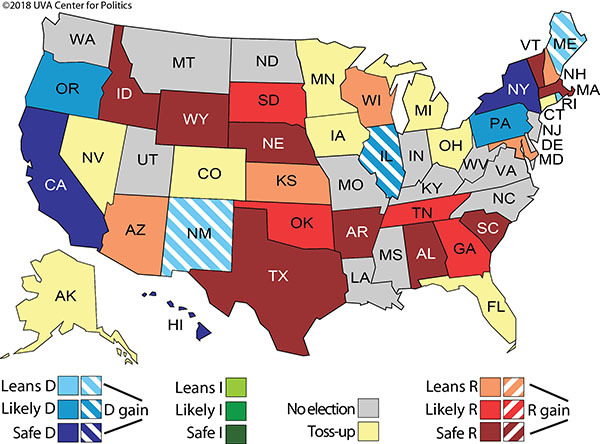 Here is the current map from Sabato's Crystal Ball. Governing.com has a nearly identical map. Both sites are predicting that the Democrats will flip three states: New Mexico, Illinois, and Maine. Both also rate eight states as tossups (yellow on the map). Sabato has Alaska as a tossup; governing has it colored black but doesn't explain what that means, probably because the incumbent, Bill Walker, is an independent. Here is a quick rundown of the tossup races, from west to east. Alaska. Gov. Bill Walker (I) is running for reelection. It won't be easy since his approval rating is deeply under water (or in the case of Alaska, under snow). The leading Democrat is former Anchorage mayor and former U.S. senator Mark Begich. He is well known and likely to win the Aug. 21 primary. The Republican race features former Lt. Gov. Mead Treadwell, state senator Mike Dunleavy, and businessman Scott Hawkins. Ideologically, Walker and Begich aren't that far apart and Democrats fear they could split the nonconservative vote, resulting in a Republican governor. Nevada. Gov. Brian Sandoval (R) is term limited, so this is an open seat. The Democrats have nominated Clark County Commissioner Steve Sisolak. The Republicans picked state Attorney General Adam Laxalt. Donald Trump has endorsed Laxalt, who is the son of former New Mexico senator Pete Domenici and of Michelle Laxalt (the daughter of former Nevada senator Paul Laxalt, who was Domenici's colleague when Adam was born). While sleeping with the daughter of a fellow Republican senator doesn't violate any of the Senate's rules, Domenici was a bit embarrassed about it and didn't go public about it until he was 80. Adam Laxalt once worked for NSA John Bolton. Polling gives Sisolak an insignificant lead, so this is a true tossup. Colorado. Gov. John Hickenlooper (D) is term limited, so this is an open seat. The Democrats have nominated an openly gay multimillionaire, Rep. Jared Polis, one of the wealthiest members of Congress. The Republicans picked state Treasurer Walker Stapleton. Polis is not at all hesitant to use his fortune to fund his campaign: He put in over $10 million of his own money during the primary and could easily top that in the general election. He is quite liberal and would normally attract plenty of out-of-state money, except he doesn't need it. Stapleton is a strong Trump supporter, especially on taxes and immigration. In a purple state like Colorado, that might be a bridge too far, plus he is not going to have anywhere near as much money as Polis. Minnesota. Gov. Mark Dayton (DFL) is eligible to run for a third term, but declined to do so. The primary is Aug. 14. The leading Republican candidates are former governor Tim Pawlenty, who is the favorite, and Hennepin County Commissioner Jeff Johnson. There are five Democrats running for the DFL nomination, the strongest of whom are Attorney General Lori Swanson and Rep. Tim Walz. Minnesota is a fairly blue state, but on the other hand, Pawlenty has already shown he can be elected governor, so this one is tough to call. Iowa. Gov. Kim Reynolds (R) is running for election as governor for the first time. She got her current job when then-governor Terry Branstad became ambassador to China. Now she is on her own. The Democrats nominated wealthy businessman Fred Hubbell, who is nevertheless raising money from donors. Since the start of 2017, Hubbell has pulled in $10 million to Reynolds' $6 million. Reynolds has accused Hubbell of not believing that Iowa is the #1 state in the nation. We all know that Iowa goes first when it comes to picking presidential candidates and also has the most pigs and corn, but there aren't a lot of other metrics in which Iowa is #1. It looks like it will be a nasty race. Michigan. Gov. Rick Snyder (R) is term limited, so this is an open seat. The primary is on Aug. 7. The Democrats have a three-way primary with three unknown candidates, Abdul El-Sayed, a former Detroit official, Shri Thanedar, an author and entrepreneur, and Gretchen Whitmer, a former state senate minority leader. Whitmer, who has the backing of the state Democratic establishment, is probably the favorite. The Republicans have a full-blown battle on their hands, with Lt. Gov. Brian Calley facing Attorney General Bill Schuette and two unknowns. Anything could happen here. Ohio. Gov. John Kasich (R) is term limited, so this is an open seat. Richard Cordray, who ran the Consumer Financial Protection Bureau, beat former "boy wonder" mayor of Cleveland Dennis Kucinich in the Democratic primary and will face former U.S. senator and current attorney general Mike DeWine (R). Of the two, DeWine is much better known due to his stints as senator and AG. Still, polling shows it to be very close, with Cordray ahead in some polls and DeWine in others. Florida. The monster battle for the Senate between Gov. Rick Scott (R) and Sen. Bill Nelson (D) is sucking all the oxygen out of the air, and will continue to do so until the Aug. 28 primary. Historically, Democrats don't do very well in gubernatorial races in Florida. The last time a Democrat was elected to Florida's top job was 1994, when Lawton Chiles won his second term. However, the large number of Puerto Ricans who have moved to the state since 2016 could change that. The Democrats have a free-for-all primary, with seven candidates running, including the mayor of Tallahassee (Andrew Gillum), a congresswoman (Gwen Graham), and the mayor of Miami Beach (Philip Levine), plus four lesser-known candidates. Polling shows that Levine is ahead and since he is wealthy, he will spend plenty of his own money to keep it that way. The Republicans also have seven candidates, including a congressman (Ron DeSantis) and the state's agricultural commissioner (Adam Putnam). Polling puts DeSantis slightly ahead. Connecticut. Connecticut does not have term limits, but unpopular Gov. Dan Malloy (D) decided not to press his luck and try for a third term, meaning this is an open-seat election. The Democrats effectively picked wealthy businessman Ned Lamont over Bridgeport Mayor Joe Ganim as their nominee at the state convention in May. Lamont challenged and beat then-senator Joe Lieberman in the 2006 senatorial primary, but lost to Lieberman (who ran as an independent) in the general election. The Republicans will pick their candidate in a primary on Aug. 14. The favorite is Mark Boughton, the nine-term mayor of Danbury, who wants to eliminate the state income tax. Still, he is facing a bunch of wealthy businessmen. If it ends up with Lamont vs. Boughton, the Democrats will be running a plutocrat against the Republicans' working stiff. But Connecticut is a very blue state, so even under those conditions, Lamont will be the favorite, especially since the national Republicans are not likely to drop a lot of money in a gubernatorial race in such a blue state. Jul23 How Is the Senate Looking? Jul22 Did Trump Give Away Crimea? Jul22 Does GOP Have an Alger Hiss Problem? Jul22 Is Will Hurd the New Whittaker Chambers? Jul21 Mueller Wants to Chat with "Manhattan Madam"